Elysa Jones, Warning Systems, Inc. The Common Alerting Protocol (CAP) is a simple but general format for exchanging all-hazard emergency alerts and public warnings over all kinds of networks. CAP allows a consistent warning message to be disseminated simultaneously over many different warning systems, thus increasing warning effectiveness while simplifying the warning task. CAP also facilitates the detection of emerging patterns in local warnings of various kinds, such as might indicate an undetected hazard or hostile act. And CAP provides a template for effective warning messages based on best practices identified in academic research and real-world experience. This document was last revised or approved by the Emergency Management TC on the above date. The level of approval is also listed above. Check the “Latest Version” or “Latest Approved Version” location noted above for possible later revisions of this document. Technical Committee members should send comments on this specification to the Technical Committee’s email list. Others should send comments to the Technical Committee by using the “Send A Comment” button on the Technical Committee’s web page at http://www.oasis-open.org/committees/emergency/. For information on whether any patents have been disclosed that may be essential to implementing this specification, and any offers of patent licensing terms, please refer to the Intellectual Property Rights section of the Technical Committee web page (http://www.oasis-open.org/committees/emergency/ipr.php. The non-normative errata page for this specification is located at http://www.oasis-open.org/committees/emergency/. Copyright © OASIS® 200910. All Rights Reserved. The names "OASIS" and “CAP” are trademarks of OASIS, the owner and developer of this specification, and should be used only to refer to the organization and its official outputs. OASIS welcomes reference to, and implementation and use of, specifications, while reserving the right to enforce its marks against misleading uses. Please see http://www.oasis-open.org/who/trademark.php for above guidance. · Facility for digital images and audio. An international working group of more than 130 emergency managers and information technology and telecommunications experts convened in 2001 and adopted the specific recommendations of the NSTC report as a point of departure for the design of a Common Alerting Protocol (CAP). Their draft went through several revisions and was tested in demonstrations and field trials in Virginia (supported by the ComCARE Alliance) and in California (in cooperation with the California Office of Emergency Services) during 2002 and 2003. In 2002 the CAP initiative was endorsed by the national non-profit Partnership for Public Warning, which sponsored its contribution in 2003 to the OASIS standards process. In 2004, CAP version 1.0 was adopted as an OASIS Standard. In 2005, changes based on user feedback were incorporated into CAP and version 1.1 was released. As part of the International Telecommunication Union (ITU-T) adoption of CAP, a CAP 1.1 Errata was released in 2007 to support ASN.1 encoding. Version 1.2 is a minor release to resolve issues identified by the EM-TC CAP Call for Comments initiated in April 2008 and also incorporates feedback from CAP profile development efforts. The <alert> segment provides basic information about the current message: its purpose, its source and its status, as well as a unique identifier for the current message and links to any other, related messages. An <alert> segment may be used alone for message acknowledgements, cancellations or other system functions, but most <alert> segments will include at least one <info> segment. The <info> segment describes an anticipated or actual event in terms of its urgency (time available to prepare), severity (intensity of impact) and certainty (confidence in the observation or prediction), as well as providing both categorical and textual descriptions of the subject event. It may also provide instructions for appropriate response by message recipients and various other details (hazard duration, technical parameters, contact information, links to additional information sources, etc.) Multiple <info> segments may be used to describe differing parameters (e.g., for different probability or intensity “bands”) or to provide the information in multiple languages. The <resource> segment provides an optional reference to additional information related to the <info> segment within which it appears in the form of a digital asset such as an image or audio file. The <area> segment describes a geographic area to which the <info> segment in which it appears applies. Textual and coded descriptions (such as postal codes) are supported, but the preferred representations use geospatial shapes (polygons and circles) and an altitude or altitude range, expressed in standard latitude / longitude / altitude terms in accordance with a specified geospatial datum. The primary use of the CAP Alert Message is to provide a single input to activate all kinds of alerting and public warning systems. This reduces the workload associated with using multiple warning systems while enhancing technical reliability and target-audience effectiveness. It also helps ensure consistency in the information transmitted over multiple delivery systems, another key to warning effectiveness. A secondary application of CAP is to normalize warnings from various sources so they can be aggregated and compared in tabular or graphic form as an aid to situational awareness and pattern detection. Although primarily designed as an interoperability standard for use among warning systems and other emergency information systems, the CAP Alert Message can be delivered directly to alert recipients over various networks, including data broadcasts. Location-aware receiving devices could use the information in a CAP Alert Message to determine, based on their current location, whether that particular message was relevant to their users. The CAP Alert Message can also be used by sensor systems as a format for reporting significant events to collection and analysis systems and centers. The words warning, alert and notification are used interchangeably throughout this document. The term “coordinate pair” is used in this document to refer to a comma-delimited pair of decimal values describing a geospatial location in degrees, unprojected, in the form “[latitude],[longitude]”. Latitudes in the Southern Hemisphere and longitudes in the Western Hemisphere are signed negative by means of a leading dash. [dateTime] N. Freed, XML Schema Part 2: Datatypes Second Edition, http://www.w3.org/TR/xmlschema-2/#dateTime, W3C REC-xmlschema-2, October 2004. [FIPS 180-2] National Institute for Standards and Technology, Secure Hash Standard, http://csrc.nist.gov/publications/fips/fips180-2/fips180-2withchangenotice.pdf, August 2002. [namespaces] T. Bray, Namespaces in XML, http://www.w3.org/TR/REC-xml-names/, W3C REC-xml-names-19990114, January 1999. [RFC2046] N. Freed, Multipurpose Internet Mail Extensions (MIME) Part Two: Media Types, http://www.ietf.org/rfc/rfc2046.txt, IETF RFC 2046, November 1996. [RFC3066] H. Alvestrand, Tags for the Identification of Languages, http://www.ietf.org/rfc/rfc3066.txt, IETF RFC 3066, January 2001. [WGS 84] National Geospatial Intelligence Agency, Department of Defense World Geodetic System 1984, http://earth-info.nga.mil/GandG/tr8350_2.html, NGA Technical Report TR8350.2, January 2000. [XML 1.0] T. Bray, Extensible Markup Language (XML) 1.0 (Third Edition), http://www.w3.org/TR/REC-xml/, W3C REC-XML-20040204, February 2004. [XMLSIG] Eastlake, D., Reagle, J. and Solo, D. (editors), XML-Signature Syntax and Processing, http://www.w3.org/TR/2002/REC-xmldsig-core-20020212/, W3C Recommendation, February 2002. [XMLENC] Eastlake, D. and Reagle, J. (editors), XML Encryption Syntax and Processing, http://www.w3.org/TR/2002/REC-xmlenc-core-20021210/, W3C Recommendation, December 2002. [ITU-T X.680] ITU-T Recommendation X.680, Information technology – Abstract Syntax Notation One (ASN.1): Specification of basic notation. [ITU-T X.691] ITU-T Recommendation X.691, Information technology – ASN.1 encoding rules: Specification of Packed Encoding Rules (PER). [ITU-T X.693] ITU-T Recommendation X.693, Information technology – ASN.1 encoding rules: Specification of XML Encoding Rules (XER). [ITU-T X.694] ITU-T Recommendation X.694, Information technology – ASN.1 encoding rules: Mapping W3C XML schema definitions into ASN.1. · Interoperability – First and foremost, the CAP Alert Message should provide a means for interoperable exchange of alerts and notifications among all kinds of emergency information systems. · Completeness – The CAP Alert Message format should provide for all the elements of an effective public warning message. · Simple implementation – The design should not place undue burdens of complexity on technical implementers. · Simple XML and portable structure – Although the primary anticipated use of the CAP Alert Message is as an XML document, the format should remain sufficiently abstract to be adaptable to other coding schemes. · Multi-use format – One message schema supports multiple message types (e.g., alert / update / cancellations / acknowledgements / error messages) in various applications (actual / exercise / test / system message). · Familiarity – The data elements and code values should be meaningful to warning originators and non-expert recipients alike. · Interdisciplinary and international utility – The design should allow a broad range of applications in public safety and emergency management and allied applications and should be applicable worldwide. Note: The following requirements were used as a basis for design and review of the CAP Alert Message format. This list is non-normative and not intended to be exhaustive. · Provide a clear logical structure that is relevant and clearly applicable to the needs of emergency response and public safety users and warning system operators. Note: The following examples of use scenarios were used as a basis for design and review of the CAP Alert Message format. These scenarios are non-normative and not intended to be exhaustive or to reflect actual practices. The Incident Commander at an industrial fire with potential of a major explosion decides to issue a public alert with three components: a) An evacuation of the area within half a mile of the fire; b) a shelter-in-place instruction for people in a polygon roughly describing a downwind dispersion ‘plume’ extending several miles downwind and half a mile upwind from the fire; and c) a request for all media and civilian aircraft to remain above 2500 feet above ground level when within a half mile radius of the fire. Using a portable computer and a web page (and a pop-up drawing tool to enter the polygon) the Incident Commander issues the alert as a CAP message to a local alerting network. A set of automatic tsunami warning sirens has been installed along a popular Northwest beach. A wireless network of sensor devices collocated with the sirens controls their activation. When triggered, each sensor generates a CAP message containing its location and the sensed data at that location that is needed for the tsunami determination. Each siren activates when the combination of its own readings and those reported at by other devices on the network indicate an immediate tsunami threat. In addition, a network component assembles a summary CAP message describing the event and feeds it to regional and national alerting networks. Using this visualization tool, state officials can monitor for emerging patterns of local warning activity and correlate it with other real time data (e.g., telephone central office traffic loads, 9-1-1 traffic volume, seismic data, automatic vehicular crash notifications, etc.). As part of an integrated warning system funded by local industry, all warning systems in a community can be activated simultaneously by the issuance, from an authorized authority, of a single CAP message. Each system converts the CAP message data into the form suitable for its technology (text captioning on TV, synthesized voice on radio and telephone, activation of the appropriate signal on sirens, etc.). Systems that can target their messages to particular geographic areas implement the targeting specified in the CAP message with as little ‘spillover’ as their technology permits. In this way, not only is the reliability and reach of the overall warning system maximized, but citizens also get corroboration of the alert through multiple channels, which increases the chance of the warning being acted upon. Inadvertently the integrated alerting network has been activated with an inaccurate warning message. This activation comes to officials' attention immediately through their own monitoring facilities (e.g., 2.3.3 above). Having determined that the alert is, in fact, inappropriate, the officials issue a cancellation message that refers directly to the erroneous prior alert. Alerting systems that are still in the process of delivering the alert (e.g., telephone dialing systems) stop doing so. Broadcast systems deliver the cancellation message. Other systems (e.g., highway signs) simply reset to their normal state. Note: Unless explicitly constrained within this Data Dictionary or the XML Schema (Section 3.4), CAP elements MAY have null values. Implementers MUST check for this condition wherever it might affect application performance. (1) Surrounds CAP alert message sub-elements. (3) In addition to the specified sub-elements, MAY contain one or more <info> blocks. (1) A number or string uniquely identifying this message, assigned by the sender. (2) MUST NOT include spaces, commas or restricted characters (< and &). (1) Identifies the originator of this alert. Guaranteed by assigner to be unique globally; e.g., may be based on an Internet domain name. (1) The date and time SHALL be represented in the DateTime Data Type (See Implementation Notes) format (e.g., "2002-05-24T16:49:00-07:00" for 24 May 2002 at 16:49 PDT). (2) Alphabetic timezone designators such as “Z” MUST NOT be used. The timezone for UTC MUST be represented as “-00:00”. The particular source of this alert; e.g., an operator or a specific device. Used when <scope> value is "Restricted". (1) Required when <scope> is “Private”, optional when <scope> is “Public” or “Restricted”.Used when <scope> value is "Private". (2) Each recipient SHALL be identified by an identifier or an address. (3) Multiple space-delimited addresses MAY be included. Addresses including whitespace MUST be enclosed in double-quotes. (1) Any user-defined flag or special code used to flag the alert message for special handling. (2) Multiple instances MAY occur. The message note is primarily intended for use with <status> “Exercise” and <msgType> “Error”. (1) The extended message identifier(s) (in the form sender,identifier,sent) of an earlier CAP message or messages referenced by this one. (2) If multiple messages are referenced, they SHALL be separated by whitespace. (1) Used to collate multiple messages referring to different aspects of the same incident. (2) If multiple incident identifiers are referenced, they SHALL be separated by whitespace. Incident names including whitespace SHALL be surrounded by double-quotes. (1) Multiple occurrences are permitted within a single <alert>. If targeting of multiple <info> blocks in the same language overlaps, information in later blocks may expand but may not override the corresponding values in earlier ones. Each set of <info> blocks containing the same language identifier SHALL be treated as a separate sequence. (2) In addition to the specified sub-elements, MAY contain one or more <resource> blocks and/or one or more <area> blocks. (1) Code Values: Natural language identifier per [RFC 3066]. (2) If not present, an implicit default value of "en-US" SHALL be assumed. (2) Multiple instances MAY occur within an <info> block. (1) The <urgency>, <severity>, and <certainty> elements collectively distinguish less emphatic from more emphatic messages. (3) For backward compatibility with CAP 1.0, the deprecated value of “Very Likely” SHOULD be treated as equivalent to “Likely”. where the content of “valueName” is a user-assigned string designating the domain of the code, and the content of “value” is a string (which may represent a number) denoting the value itself (e.g., valueName ="SAME" and value="CEM"). (2) Values of “valueName” that are acronyms SHOULD be represented in all capital letters without periods (e.g., SAME, FIPS, ZIP). (3) Multiple instances MAY occur within an <info> block. (1) The date and time SHALL be represented in the DateTime Data Type (See Implementation Notes) format (e.g., “2002-05-24T16:49:00-07:00” for 24 May 2002 at 16: 49 PDT). (3) If this item is not included, the effective time SHALL be assumed to be the same as in <sent>. (1) The date and time SHALL be represented in the DateTime Data Type (See Implementation Notes) format (e.g., “2002-05-24T16:49:00-07:00” for 24 May 2002 at 16:49 PDT). (3) If this item is not provided, each recipient is free to set its own policy as to when the message is no longer in effect. The human-readable name of the agency or authority issuing this alert. A brief human-readable headline. Note that some displays (for example, short messaging service devices) may only present this headline; it SHOULD be made as direct and actionable as possible while remaining short. 160 characters MAY be a useful target limit for headline length. An extended human readable description of the hazard or event that occasioned this message. An extended human readable instruction to targeted recipients. If different instructions are intended for different recipients, they should be represented by use of multiple <info> blocks. A full, absolute URI for an HTML page or other text resource with additional or reference information regarding this alert. where the content of “valueName” is a user-assigned string designating the domain of the code, and the content of “value” is a string (which may represent a number) denoting the value itself (e.g., valueName ="SAME" and value="CIV"). (1) Refers to an additional file with supplemental information related to this <info> element; e.g., an image or audio file. The human-readable text describing the type and content, such as “map” or “photo”, of the resource file. (1) Approximate size of the resource file in bytes. (2) For <uri> based resources, <size> SHOULD be included if available. a relative URI to name the content of a <derefUri> element if one is present in this resource block. (1) MAY be used either with or instead of the <uri> element in messages transmitted over one-way (e.g., broadcast) data links where retrieval of a resource via a URI is not feasible. (2) Clients intended for use with one-way data links MUST support this element. (3) This element MUST NOT be used unless the sender is certain that all direct clients are capable of processing it. (4) If messages including this element are forwarded onto a two-way network, the forwarder MUST strip the <derefUri> element and SHOULD extract the file contents and provide a <uri> link to a retrievable version of the file. (5) Providers of one-way data links MAY enforce additional restrictions on the use of this element, including message-size limits and restrictions regarding file types. Calculated using the Secure Hash Algorithm (SHA-1) per [FIPS 180-2]. (1) Multiple occurrences permitted, in which case the target area for the <info> block is the union of all the included <area> blocks. (2) MAY contain one or multiple instances of <polygon>, <circle> or <geocode>. If multiple <polygon>, <circle> or <geocode> elements are included, the area described by this <area> block is represented by the union of all the included elements. A text description of the affected area. (2) A minimum of 4 coordinate pairs MUST be present and the first and last pairs of coordinates MUST be the same. (3) Multiple instances MAY occur within an <area> block. (2) Multiple instances MAY occur within an <area> block. where the content of “valueName” is a user-assigned string designating the domain of the code, and the content of “value” is a string (which may represent a number) denoting the value itself (e.g., valueName ="SAME" and value="006113"). (4) This element is primarily for compatibility with other systems. Use of this element presumes knowledge of the coding system on the part of recipients; therefore, for interoperability, it SHOULD be used in concert with an equivalent description in the more universally understood <polygon> and <circle> forms whenever possible. (1) If used with the <ceiling> element this value is the lower limit of a range. Otherwise, this value specifies a specific altitude. (2) The altitude measure is in feet above mean sea level per the [WGS 84] datum. (1) MUST NOT be used except in combination with the <altitude> element. (2) The ceiling measure is in feet above mean sea level per the [WGS 84] datum. Geographic locations in CAP are defined using [WGS 84] (World Geodetic System 1984), equivalent to EPSG (European Petroleum Survey Group) code 4326 (2 dimensions). CAP does not assign responsibilities for coordinate transformations from and to other Spatial Reference Systems. See section 1.5 Terminology for the format of coordinate pairs within CAP elements. · X indicates either the symbol “+” if the preceding date and time are in a time zone ahead of UTC, or the symbol “-‘ if the preceding date and time are in a time zone behind UTC. If the time is in UTC, the symbol “-“ will be used. time might be indicated by “2002-05-30T14:30:10-00:00”. The use of character entity references, such as HTML entities (e.g. &nbsp;) is discouraged. Because CAP is an XML-based format, existing XML security mechanisms can be used to secure and authenticate its content. While these mechanisms are available to secure CAP Alert Messages, they should not be used indiscriminately. Note that this section adds two elements to CAP by reference. These are: <Signature> and <EncryptedData>. Both elements are children of the <alert> element and are optional. If the <EncryptedData> element exists, no other elements will be visible until after the message is decrypted. This makes the minimal CAP message an <alert> element which encloses an <EncryptedData> element. The maximal CAP message, if an <EncryptedData> element is present is an <alert> element enclosing a single <EncryptedData> element and one or more <Signature> elements. The <alert> element of a CAP Alert Message MAY have an Enveloped Signature, as described by XML-Signature and Syntax Processing [XMLSIG]. Other XML signature mechanisms MUST NOT be used in CAP Alert Messages. Processors MUST NOT reject a CAP Alert Message containing such a signature simply because they are not capable of verifying it; they MUST continue processing and SHOULD MAY inform the user of their failure to validate the signature. In other words, the presence of an element with the namespace URI [XMLSIG] and a local name of <Signature> as a child of the <alert> element must not cause a processor to fail merely because of its presence. The <alert> element of a CAP Alert Message MAY be encrypted, using the mechanisms described by XML Encryption Syntax and Processing [XMLENC]. Other XML encryption mechanisms MUST NOT be used in CAP Alert Messages; however, transport-layer encryption mechanisms may be used independently of this requirement. The ASN.1 (see ITU-T Rec X.680) schema in 3.5.3 provides an alternative formulation of the XML schema defined in 3.4. If the ASN.1 Extended XML Encoding Rules (see ITU-T Rec X.693) are applied to this ASN.1 schema, the permitted XML is identical to that supported by the XML schema in 3.4. If the ASN.1 Unaligned Packed Encoding Rules (see ITU-T Rec X.691) are applied to it, the resulting binary encodings are more compact than the corresponding XML encodings. The normative specification of the compact binary encoding is in 3.5.3 with the application of the ASN.1 Unaligned Packed Encoding Rules (see ITU-T Rec. X.691). The semantics of the fields in the ASN.1 specification are identical to those of the XSD specification, and the mapping of the fields from the XSD specification to the ASN.1 specification is formally defined in ITU-T Rec. X.694. Implementations can produce and process the CAP alert XML messages using either ASN.1-based or XSD-based tools (or other ad hoc software). Implementations can produce and process the CAP alert compact binary messages using ASN.1-based tools (or by other ad hoc software). Any XML encoded CAP alert messages can be converted to compact binary messages by decoding with an ASN.1 tool configured for the Extended XML Encoding Rules and re-encoding the resulting abstract values with an ASN.1 tool configured for Unaligned Packed Encoding Rules. Any compact binary CAP alert messages can be converted to XML encoded messages by decoding with an ASN.1 tool configured for Unaligned Packed Encoding Rules and re-encoding the resulting abstract values with an ASN.1 tool configured for Extended XML Encoding Rules. -- identified in the "sender" field below. -- The globally unambiguous identification of the sender. -- An internet domain name or use of "iri:/ITU-T/..."
-- the choice needs to be clearly stated in human-readable form. -- of the source of the alert. NAMESPACE ALL, ALL IN ALL AS "urn:oasis:names:tc:emergency:cap:1.2"
An implementation conforms to this specification if it satisfies all of the MUST or REQUIRED level requirements defined within this specification. This specification references a number of other specifications. In order to comply with this specification, an implementation MUST implement the portions of referenced specifications necessary to comply with the required provisions of this specification. Additionally, the implementation of the portions of the referenced specifications that are specifically cited in this specification MUST comply with the rules for those portions as established in the referenced specification. 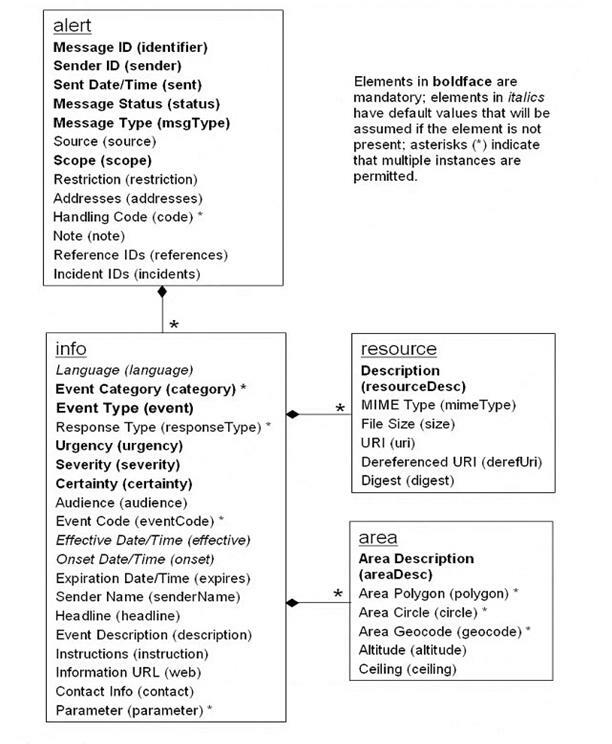 b) the content of its elements and the values of its attributes meet all the additional mandatory requirements specified in Section 3.
a) it is constructed in such a way that any XML document produced by it and present in a place in which a conforming CAP V1.2 Message is expected (based on contextual information) is indeed a conforming CAP V1.2 Message according to this standard. a) it is constructed in such a way that it is able to successfully validate and ingest a conforming CAP V1.2 Message according to this standard. The following is a speculative example in the form of a CAP XML message. Patrick Gannon, Warning Systems, Inc.
Tim Grapes, Evolution Technologies Inc.
Harry Haury, NuParadigm Government Systems, Inc.
Jeff Kyser, Warning Systems, Inc.
Ron Lake, Galdos Systems Inc.
Dean Reese, ESI Acquisition, Inc.
Howard Ryan, Desktop Alert Inc.
Josh Shows, ESI Acquisition, Inc.
Andrew Sonner, Evolution Technologies Inc.
Lee Tincher, Evolution Technologies Inc.
Technical Committee approved changes that removed XML Digital Encryption within CAP messages. Technical Committee approved the v. 1.2 draft submitted by the Messaging Subcommittee with a duplicate Normative Reference entry removed. Technical Committee approved the v. 1.2 draft submitted by the Messaging Subcommittee with a change made to responseType in the ASN.1 schema. · Reordered items in object diagram and data dictionary to match sequence required by schema. · Edited schema to make <scope> mandatory and to permit multiple instances of <responseType> and <eventCode>, in accordance with the data dictionary. · Conformed examples in Appendix A to new namespace.